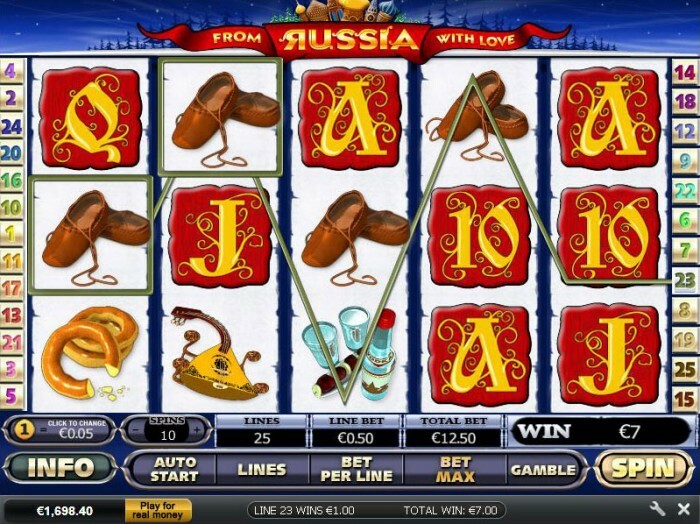 From Russian with Love is an online casino game with 25 paylines. It is a thrilling game that has a theme packed with Russian culture. Many people hear its name and they automatically think that it is based on a James Bond 007 movie, but the game and movie have no ties with one another. The game’s first recognizable symbol is the Russian Kremlin. This is one of Russia’s most prized treasures. The game is filled with clothing, craft and food symbols that are very much associated with old Russia. The game has a very Tsarist looking embroidery sketched on the ace, king, queen, jack and ten face cards. This adds an elegant charm that is reminiscent of traditional Russian culture. Other Russian symbols in the game are the onion, Russian styled shoes, Russian donuts, the Russian Lute and the Samovar. The animations for From Russia with Love are awe inspiring, and they really make you feel as if you are in the old country. Each of the symbols has a way of dancing to music that is depicted in Russian history. For instance, a teacup and cake dance beautifully to the music whenever you get a winning combination. You’ll love listening to distinctive Russian folk songs as you build up more credits and win more money. From Russia with Love is powered by the world famous Playtech software. It provides several customization options such as Autoplay. It also offers game history for players to analyze their stats for future betting. Most players tend to give From Russia with Love a high rating. It is easy to understand because information about the game can be obtained by clicking on a button below the screen. You can play each of the 25 paylines and bet up to 10 coins on each of them. Depending on the denominations played, you could play a maximum line bet of 50 credits. The max total bet for each spin is 1250 credits. As you can see, high rollers will be happy with From Russia with Love, and considering that it comes with a gamble game in which they can double their luck. This will really increase gaming excitement for high rollers. From Russia with Love’s wild symbol is the onion, which is symbolic of Russia’s stunning architecture. However, it is not a multiplier for the game. The vodka symbol is the scatter symbol, and it is triggered whenever you get three of these symbols on any one reel. Get five scatter symbols and you will gain an equivalent of 312,500 credits, which can only be achieved by betting the maximum. This might seem like a lot of credits, but the onion symbol provides the most credits in the game. Remember that it is the wild symbol, and it pays 500,000 credits. You can access the bonus round, which is called the Matryoshka Bonus, whenever the Russian doll symbol is triggered. Although this game is on the second screen, you won’t receive any payouts on this screen as with most bonuses. The Matryoshka has five tiers. You must pick a doll on each level in order to get free spins on that level. However, in order to rise to the next level and get more spins, you must pick the right doll. Choose the wrong doll and your free spin opportunities are eliminated. However, if you get through all five levels in the Matryoshka Bonus, your free spins will double in amount. This bonus round provides a max of 74 free spins. From Russia with Love is a very well-liked online casino game, but it does not have a progressive jackpot. However, it does have some very attractive fixed jackpots. The highest jackpot offers 10,000 coins, and the second highest jackpot offers 500 coins. Get five like symbols and win from 50 to 10,000 credits. As you can see, From Russia with Love is a thrill a minute. Play the game and learn about Russian culture at the same time. It is a wonderful way to have fun and win an exciting jackpot.